The Wine – This is a truly lovely full-bodied wine. The color is a dark ruby. On the nose there is currant, cherry and, believe it or not, a vanilla milkshake. I know that sounds as if it may be over oaked, but it really isn’t. On the palate there is licorice and the currant, along with some blackberry. I found the tannins to be evident, but not overpowering. The wine is very drinkable now, although one should decant it for at least an hour. With time, this wine will become even better. I rate this wine 91 points. My Experiences Visiting The Winery – This is one of my favorite wineries in California, not only because of the wines, but also because of the tasting experience. When you go deep into the caves, you’ll get some fabulous barrel tastings. This isn’t the typical “tour”. This is a very special tasting. On one of our visits we were shown the actual county line that separates Sonoma from Napa. 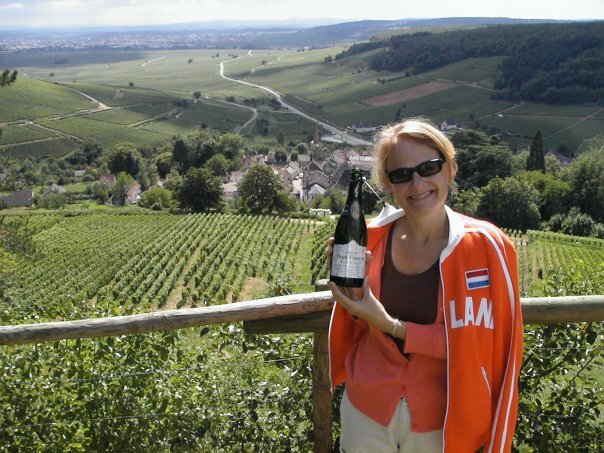 We also had the opportunity to see the Wine Maker, Sally Johnson, doing “her thing” during harvest. An appointment is needed for a tasting here. 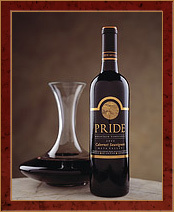 The Journey – Pride Mountain Vineyards is on Spring Mountain. The Napa and Sonoma county lines are literally on their property. You need to drive some beautifully curvy mountain roads to get there, but it’s worth it for many reasons. When you get to the winery, the views are magnificent, and so are the wines!